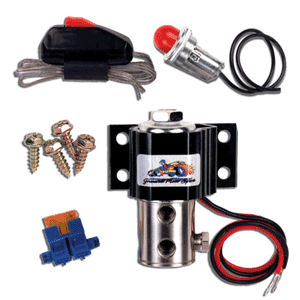 * Re-buildable nickel plated solenoid Now theres an easy way to lock your front or rear brakes at will. Why would you want to do that? If your truck is towing a heavy vehicle down hill or if your vehicle is at the drag strip and you want to keep your vehicle straight in the staging lanes until you are ready to launch. Our line lock features 1/100,000 of a second release time and has been tested up to 30 Gs without mechanical failure. Our Quality & Finish will leave you with a grin from ear to ear as it is the Best looking unit available for your Ford Mustang or Cobra. Quality Construction: Each line lock features a re-buildable nickel-plated solenoid valve, activation switch (shifter mountable), arming light, stainless steel inserts, black chromate heat sinks. No one else gives you the bold clean styling of our Aftermarket Dress Ups, Suspension and Performance Parts for your American Muscle Car! Installs in 1 hour or less. Fits these Vehicles: 1979 1980 1981 1982 1983 1984 1985 1986 1987 1988 1989 1990 1991 1992 1993 1994 1995 1996 1997 1998 1999 2000 2001 2002 2003 2004 GT LX GTS Cobra 5.0 4.6 v8 Mustang Steeda Roush & Saleen Vehicles.